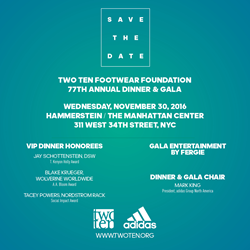 Two Ten Footwear Foundation, the national charitable foundation of the U.S. footwear industry, announced plans today for its 77th annual VIP Dinner and Gala, “One Team.” Scheduled for Wednesday, November 30, 2016, the industry’s premier, dual-event evening of philanthropy and entertainment will be held at the legendary Hammerstein Ballroom in New York City’s Manhattan Center. Mark King, President of adidas Group North America, is serving as Gala Chair and host, with his team actively supporting development and production of the festivities. The evening will begin with a VIP Dinner in the Grand Ballroom, with 500 of the footwear industry’s most influential Two Ten leaders and supporters in attendance. Cocktails will be followed by an exciting program including a live auction of showcase prizes, special tributes to Two Ten clients and industry icons, and presentation of prestigious awards to three outstanding industry leaders. Jay Schottenstein, Chairman of DSW, Inc., AEO Inc., American Signature Inc./Value City Furniture, Schottenstein Property Group, SB Capital Group and Schottenstein Stores Corp., will be honored with the T. Kenyon Holly Award for his outstanding humanitarian achievement; Blake Krueger, President, Chairman and CEO of Wolverine Worldwide will receive the AA Bloom Award for his years of commitment to Two Ten Footwear Foundation; and Tacey Powers, VP CMM Nordstrom Rack Shoes will accept the Two Ten Social Impact award for her commitment to giving back to the footwear community. Downstairs in the Ballroom, nearly two thousand shoepeople will gather to enjoy cocktails, lite fare and dancing in an environment designed exclusively for the event, with Fergie taking the stage at 9:00 PM. Specially arranged by Two Ten board chair and Caleres CEO, President and Chairman Diane Sullivan, the eight-time Grammy Award-winning, multi-platinum solo artist and vocalist for The Black Eyed Peas will electrify the crowd with a live concert. Founded in 1939, the Two Ten Footwear Foundation is the national charitable foundation of the footwear industry, providing emergency financial assistance, scholarships, counseling services and community building programs that change the lives of thousands of shoepeople in the United States every year. The only industry-centric foundation in the country, Two Ten brings shoepeople together to support each other during times of crisis and to build a sense of community that ensures a bright future for our industry’s workforce. For more information, please visit http://www.twoten.org.